I can't help it. I'm obsessed with banana muffins. Whenever someone asks me if I have a favourite banana muffin recipe, the answer usually is "What type of banana muffin?" the reply? "What type? Isn't there just one?" Whilst you may have thought banana muffins were simple - different recipes actually suit different purposes. 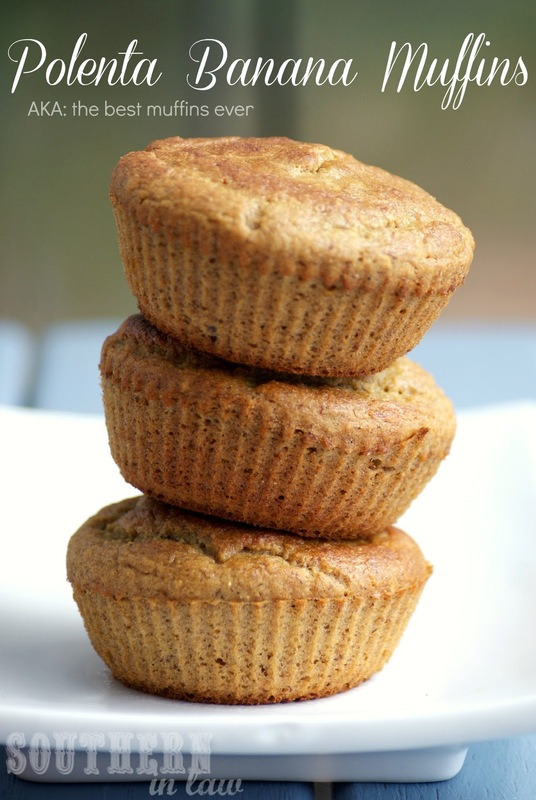 You see, you have your breakfasty Flax Banana Yogurt Muffins, you're sweet cake-like but still just dense enough Healthier Banana Muffins, your tropical style Coconut Banana Muffins, your super moist, super healthy and super fluffy Zucchini Banana Muffins and don't forget your energy boosting Banana Protein Muffins and Coconut Banana Protein Muffins. Going off that list above, I bet you can gather that I get incredibly excited everytime I see brown spotty bananas in my fruit bowl. But back to these muffins. You want to know what these Polenta Banana Muffins are? They are THE MOST INCREDIBLE MUFFINS EVER. They're light, they're fluffy, they're full of banana flavour - not to mention they're gluten free, low fat, eggless and easily a clean recipe. Can I get an amen? I know what you're thinking - stop talking woman, I've got miracle muffins to make! Your wish, is my command. 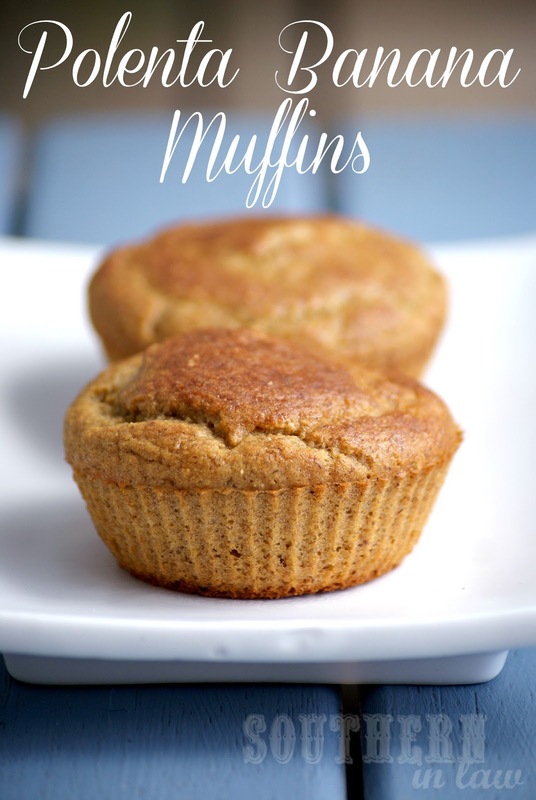 Makes 12 Muffins and Can also be made into a Polenta Banana Cake! Prepare muffin tins or grease/line an 8" cake tin. In a bowl combine the flour, oat flour, polenta, baking powder, baking soda and salt. In another bowl mash the banana and mix in the sugar/honey, applesauce and yogurt. Add the wet ingredients to the dry ingredients, mixing until combined. Divide into muffins tins (about 3/4 full) or pour into your prepared cake tin. Note: You'll notice my muffins look really flat - and that's because they were made in texas sized muffin tins. Louisiana boy Jesse has a problem with regular sized muffins but for some reason texas sized muffins with the same amount of mixture are okay :P If you make them in normal muffin tins they'll rise perfectly! So tell me, what's your favourite kind of muffin? that's so different, gotta try these babies out! I'm so the same, I reckon 95% of baking I do always contains bananas; It's ridic! Definitely make them, they are amazing! My sister is really fussy and doesn't like cake (unless it's from a cake mix -.-) but she has asked me to make these 3 times since the first time and has decided they are her absolute favourite muffins! 1. Can coconut yogurt be substituted for the Greek? We are dairy free. 2. Can you use just cornmeal and not make it into polenta? Thank you! These look amazing and we're hoping we can adapt the recipe to our family's nutritional needs. I've never used Coconut Yogurt, however, if it has the same texture it could definitely work! I've just made a batch of these and put them in the oven. It is bizarre making muffins without any of the usual muffin ingredients (fat, flour, sugar, egg)... hope they turn out ok!